Happy Memories or Tears and Tantrums--How Can You Be Sure Your Flower Girl Will Behave? Don’t try to force a reluctant child into being a flower girl—While you may want your adorable niece to fill the position, you could be setting her up for failure by pressuring her into a role that she isn’t yet emotionally or developmentally able to handle. 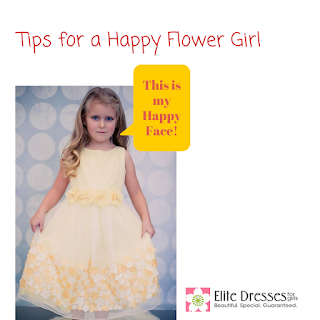 Keep the child’s disposition and level of development in mind when selecting your flower girl. Be realistic about your time-frame—Wedding days are long, full of preparation, pictures and unforeseen delays. As the mom, you need to be upfront with the bride about your child’s schedule (naps, meals, etc. ), as well as her limits. For example, if your child does not have the patience to wait for extended periods, discuss a later arrival time with the bride to maximize on your daughter’s attention span. For brides, talk with the child’s mother and figure out how you can tweak the schedule so that her routine isn’t excessively disrupted. Provide activities to keep her entertained—Plan on something to keep her attention during prep time. A tablet, DVD, new toy or other distraction will help avoid boredom that leads to meltdowns. Save dressing her for last—Inevitably, the flower girl is going to want a snack or a drink, and you don’t need the stress of worrying about whether she will stain her dress. Furthermore, a hungry or thirsty child is not a happy child. Make sure her meal schedule isn’t hampered. Practice makes perfect—Allow for plenty of practice and rehearsal. Parents can practice with her at home, but she still will need the opportunity to get comfortable in the venue. Even the most outgoing child can freeze and panic in unfamiliar settings. Empower her at the rehearsal so she knows exactly what will happen. Above all else, remember that life is not perfect. Even with the best planning, you may still end up with a rogue flower girl who makes a mistake or does something silly. Before you get frustrated, remember that she is still a child and she doesn’t need to feel the pressure or responsibility for someone else’s idea of perfection. In the end, the memories of the day need to be positive. Treat your flower girl with the same care and consideration as your family and wedding party, and you will help her shine in her awesome role.